These are Skew from Knitty’s Winter 2009 issue, which I’m currently knitting for Z. It’s no exaggeration to say that the design of this sock is pure genius. The designer’s bio boasts two math degrees, which is probably the minimum requirement to pull off a stunt like this. Each time I complete a section of this pattern, I wonder (out loud, at times) what on earth is going to happen in the next section; something I do with really good books, but never with knitting patterns. 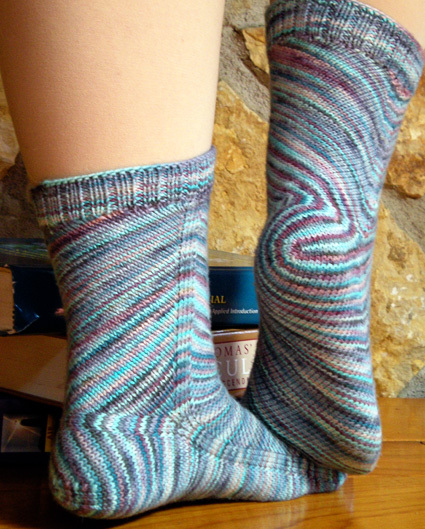 Lana didn’t simply create a cool new sock design, she totally upended, destroyed, and reconstructed the way socks get knit. None of my patterns have done this. Which is fine with me. Innovation is a tall order. I’m happy to be the lucky recipient of someone else’s genius. 1 Eating, sleeping, drinking homebrew, messing up the kitchen, shoving too much stuff into my closet, accidentally hitting my head, losing my keys, making fun of hipsters, and getting my twins to go to bed. That’s about it, really. I think your design ROCKS! And I’m pretty sure a LOT of people get concepts from all over to create a design. I know I do. Those socks are pretty effing cool, though. I’ve seen them before and I am too intimidated to even try to knit them. I can’t even fathom the designing of them. I leave that kind of stuff up to the people at NASA. Happy New Year! Hey Jesse, it takes someone creative to take aspects from different things and put them together – so you’re a better designer than you give yourself credit for. Plus, they say there are no new original ideas anyways! Keep up the good work! Please do not be so hard on yourself. A creative person/designer uses the things they see in the world around them and puts those things together in a way that has not been done before. I made this sweater for my husband and he loves the pattern and his sweater. He is not an easy man to knit for, very particular. He feels very chic in this sweater. He is always getting compliments on it too! I usually never post comments but felt this pattern really warranted one. Hey Jesse, Thank you for sharing your designs here. As a knitter, it really give me some inspiration to do some thing more fashionable and formal designs. 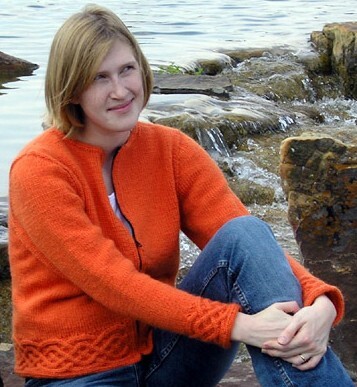 Really awesome designs, I know my friend Matt would be very happy knitting like your designs. I would be very glad to tell him about your blog. I’ve been meaning to thank you for the Half-Dome pattern in Knitty. I actually did knit it using double pointed needles and it resulted in an absolutely fabulous warm winter hat, which is much needed in Canada. Thank you very much for creating this design. It is greatly appreciated. Jesse – was just following links of some facebook friends back from High School East. Don’t know why but you popped in my head and I wondered what you might be up to. I think I might have found you via linked in. 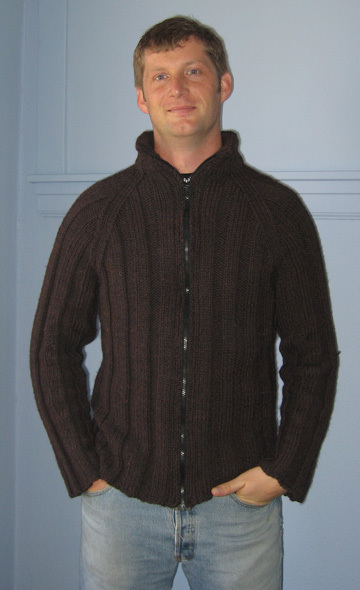 I just want to say I think your yarn boy site is awesome as is your abilities knitting. Also, somewhat envious of your creative writing career as its a hidden desire of mine. Take care and stay well!! 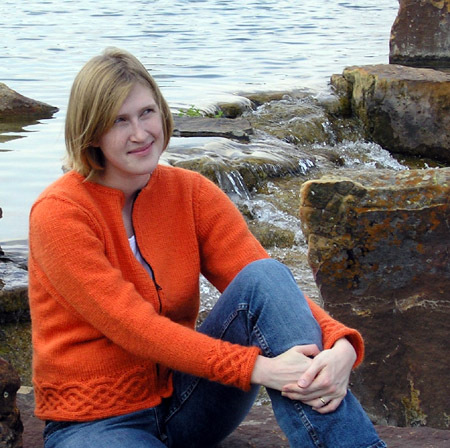 I am almost finished knitting the Avast sweater. It took me forever to find a sweater that my husband might actually wear! LOL! I wonder if you can tell me why you instruct the knitter to block the sweater prior to sewing the facing down. Does it really make a difference if you block first or can you sew the faings in place and then block? Does one really create a cleaner look? I don’t have a lot of experience in this area. Oh, Do I Blog Here? © 2019 Yarn Boy. All Rights Reserved.